For many of us who spend a lot of time thinking of the early days of stock car racing in the Northwestern Vermont/ Eastern New York region, you can refer to the name “Jackie”, and almost everyone knows to whom you are referring – Jackie Peterson. Jackie goes back in stock car racing about as far as possible, and that makes him one of the most valuable resources of information left living. According to Jackie, he actually began racing before stockers were really going, full-fledged. He ran sprint cars in that same era as the roadsters in New York. His sprint cars ran several local tracks, in addition to the state fair circuit before the less expensive stock cars made big inroads. He was flying around in those open-wheeled, sometimes-cages death traps as early as 1947. Naturally, when the big stars would appear at the fair shows in the region, Jackie would join them. He recalls qualifying against the likes of the great Ted Horn and Bill Holland at the Champlain Valley Exposition in Essex Junction, Vermont in 1947. Peterson qualified in the top ten with his own Offenhauser – powered sprinter and says he outlasted many better-financed teams to finish well up in the top ten. This was not often done by local talent in those days. Profoundly hard of hearing most of his life, Jackie had been able to follow his racing interests partly because of apparent ability and partly because his father, Howard Peterson, was the Diamond T truck dealer in the Greater Burlington, Vermont area. Apparently, the Peterson dealership was somewhere in South Burlington near the location of the present day Gracie’s Convenience store. Jackie could work at the dealership and use his father’s connections to purchase discounted parts and supplies. It was still in the late 1940’s when Jackie became fast friends with a young Colchester man named Bill McDonald, who also toyed with sprint cars. I actually recall McDonald, red bandana and all, competing in a sprint car race at the Rutland Fair around 1959. It must have been something to be around the two, trying to communicate because Bill was just as hard of hearing as Jackie. Peterson came up with the big idea of buying a particular truck that his father had for sale at the Diamond T dealership. Jackie proposed they could make some good money with long – distance trucking gigs, with the two of them trading off the driving chores. Jackie says McDonald put the kybosh on that idea, saying he would never sleep, knowing Peterson was driving. Jackie raced anywhere and everywhere he could unload his sprint car. One such place was the long-forgotten Champlain Speedway in Ticonderoga, New York. The track operated in the 1950’s, and often Jackie and another driver named Kenny Gallup took turns being the fastest car there. He points out that they could turn the three-eighths miles track in speeds that were clearly too fast to be safe. But, by 1950, stock cars were all the rage, and they were both cheaper and less hazardous than their predecessors, the sprinters and roadsters. Not only had new stock car tracks sprung up all over the area, but many of the old sprint car venues and even some fairgrounds now opened their gates to the stock cars. Stock car racing, in those days, could actually earn you a living if you had any idea what you were doing – and Jackie Peterson did know. In the very early 1950’s he could travel around to any of five tracks in Chittenden County, Vermont; any of three tracks in Franklin County, Vermont; to three or four tracks in New York; to Dog River Speedway in Northfield, Vermont; and any of five tracks in southern Quebec. This does not include making longer trips into southern Vermont or further down into New York. 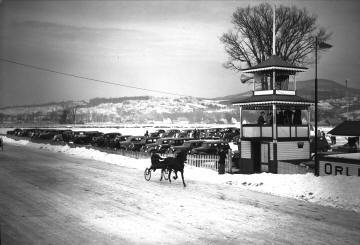 Typical of that era, most tracks would have at least one big race a year; and, naturally, each one of these would be tagged as “The Vermont State Championship” [or New York, depending on location]. Jackie won such a race at Dog River, in 1950, at the old fairgrounds track in Northfield. He said you had to be a little aware of what you were doing at Dog River because, if you went off one particularly portion of the track, you rolled over a bank and landed on some railroad tracks below. Beaver Dragon has also spoken of concern for this same situation at Northfield. Jackie was one of the sport established stars when the State of Vermont decided it had enough of stock cars and tried dredging up some of the state’s archaic blue laws to put an end to Sunday afternoon racing – at least within state borders. This had come about after a fatality at races at the Champlain Valley Exposition and then an unfortunate accident at Colchester Raceway not long after that involved casualties among the fans. Jackie was running Ivanhoe Smith’s Colchester Raceway, at the time, and he joined a group of Smitty’s regular drivers who decided to buck the racing ban. In came the newly-formed Vermont State Police, along with a number of the local constabulary, and Jackie and his cronies were carted off to jail. Smith came along and dutifully posted a lot of money to bail them all out. Jackie says it was his first and last experience behind bars, but he laughs about the whole thing now. Down South at Stateline Speedway in North Bennington, they had a different approach. The track straddled the border between North Bennington and Cambridge, New York. So, promoters simply moved the start/finish line a few yards to the west. Now racing started in New York, and there was apparently little Vermont official could do about it. Peterson even ran as far South as Stateline during this difficult period. He also appeared at Rutland’s Pico Raceway, Fair Haven’s Fairmont Speedway, and North Granville, New York’s Mettawee Speedway. Peterson was always among the leaders in the sport. He tells me he had a lot to do with the laying out of Walter Barcomb’s track in Malletts Bay. This became the premier track in Vermont’s most populated county, before the era of Catamount Stadium. Jackie would have liked to try Catamount, but he had long retired by then. Stock car racing was an adventure in this time – for driver, owner, promoter, and fan alike. Ken Squier, now a nationally-known motor sports announcer and track owner, was only a youngster starting out in the early 1950’s. He had announced at a number of tracks as a teenager, but now he decided to promote an event at Barton, Vermont’s historic fairgrounds, way up in Vermont’s Northeast Kingdom. The somewhat – reluctant fairgrounds board of directors had told Squier to go ahead and use the track – and they even allowed him to make a few alterations – but NO ONE was to driver through one particular portion of the grounds right near the edge of the old horse track. Squier went so far as to have an additional fence constructed near that portion of the track. Well, it was dusty and the old horse track wasa naturally not laid out for even the old-fashioned stock cars. That particular track may not have even been used by sprinters or midgets in its day. Of course, Jackie Peterson was the first one to swerve off, through both fences and into the forbidden area [whatever it was]. To add insult to injury, Allen Shangraw and Rex Shattuck also went through the same hole in the fence at other junctures in the race. Squier left Barton an unpopular man. Jackie had finally settled into racing primarily in Colchester, Vermont and Plattsburgh, New York. Although he did venture to some more bucolic site, out into the boondocks. In racing at the same venues more or less regularly, he developed “relationships” – some good and some not so good in those years. Jackie, with one of his better-looking cars around 1957 at Airborne. One of Bob Bushey’s famous #Spud 19’s – the 1934 Ford – was originally built by Jackie. Jackie had a big old LaSalle that he used as his personal road car, and his friend, Leonard “Bulldozer” Barcomb, had an Auburn. They two would race these powerful cars through towns, when they weren’t racing each other on a track. Jackie relates how the first time he ever rolled a car, it landed back on all fours and he had just gotten it going again when Barcomb came around, ran into him, and rolled him again – all on the same lap. Jackie was in the field of cars the day that Art Bessette, a spectator that particular day, was killed at the Champlain Valley Exposition fairgrounds in 1951. Henry LeClaire was flagging that day and was among the officials who had repeatedly tried to get Bessette to move back from the racing surface when Clyde Yarnell’s #29 tangled with another car and careened into the infield, striking Bessette. What made it all worse was a local newspaper caught the moment on film and it was all over the next edition. Jackie, Bulldozer, Ronnie “Rollover” Farnsworth, and the others tried to be loyal to Ivanhoe Smith as long as his Colchester Raceway [Near Essex] was operating. Jackie recalls a comment Smith made, one afternoon at the track, to Farnsworth. Ronnie was told “I don’t care what else you do, but – if you don’t roll over today – don’t show up [at work] Monday !” Jackie added that another of Smith’s men was the unfortunate Bessette, who was killed at Essex that same year. 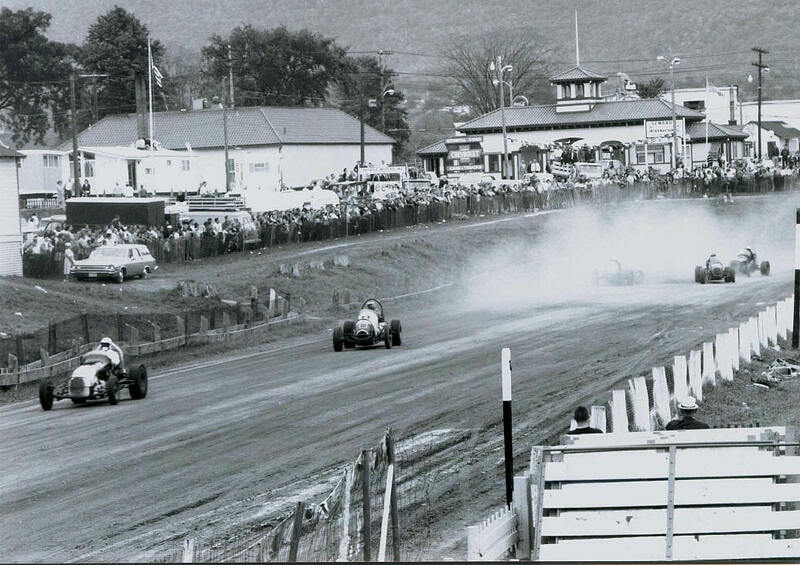 Jackie’s race experience ranged from tracks on peoples; farm in places like Sheldon ,Vermont to Earl Greer’s rough, soft-surfaced half mile track in South Burlington, to fairly organized tracks such as Stateline and Airborne. He ended up getting to drive some fairly decent sportsman coupes, such as those of Royce Tucker and New York’s Shirley Wallace. In his 80’s now, Jackie can still reel off more information than most people half his age – and certainly more than I can keep up with. I have never heard anyone, when discussing Jackie Peterson, ever say anything uncomplimentary. You can’t ask for much more than that. Jackie stands with reknowned builder Royce Tucker and the 7VT – at Airborne.